Helping you to understand and improve your internet connection, this buying guide will walk you through all the important questions to consider when upgrading your home connectivity. Ensuring you pick the right product for your home, the below sections will explain all the products that can make the most of your internet connection. From powerlines and range extenders to network adapters and switches, we have the solution to any connectivity need. Routers are essential parts of your internet network, often provided by your network provider. But if you want improved range, faster speeds and more stable connections, upgrading your router is a quick and easy way to achieve better performance. Why should I upgrade my router? Most modern homes have a number of devices that connect to the internet like smartphones, tablets, computers, consoles and smart TVs. Because of the increasing number of connected devices, single-band N-speed routers aren’t able to keep up with the networking demands of most homes. If you regularly have to wait for web pages to load, struggle with signal and experience lag when streaming content online, it might be time for an upgrade. Do I need a Cable or Modem router? Your router will either plug directly into your phone socket or connect via a modem, depending on your service provider. If you have an ADSL connection like BT Standard, then you will need a modem router. But if you have cable or fibre optic broadband like BT Infinity or TalkTalk Fibre, then you will need a cable router. What is the difference between N and AC speed? If you don’t connect many devices to your router, N speed is sufficient to keep you connected. But if you want to make the most of high speed connections and fibre optic broadband, AC connections offer the fastest speeds. Perfect for gaming online, streaming in high quality and downloading at speed, AC routers can support over 10 devices at once – ideal for well-connected homes. 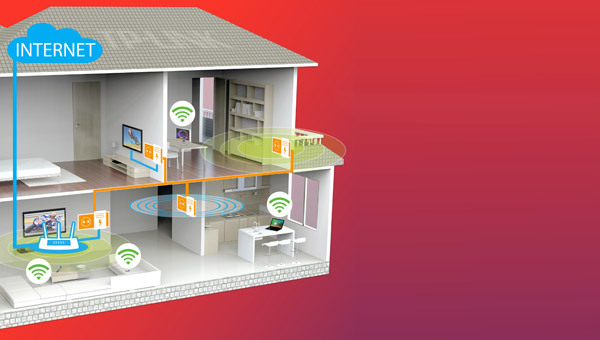 AC WiFi also uses beamforming, which directs the signal to specific devices in your home for a more stable WiFi connection. With the majority of new and upcoming wireless devices supporting AC connectivity, choosing an AC router is a great way to future-proof your home. How many bands do I need? When buying a new router, range is just as important to consider as speed. The three different bands offer different types of range, so that you can ensure your entire home is covered. Single band routers are congested and frequently lose connections, but offers capable long range connectivity for a few devices. Dual band routers provide two signals at the same time, so that you can access high speed internet and reliable online access to multiple devices. Tri-band routers are perfect for big homes, capable of connecting a large number devices to fibre-optic internet. Powerlines send your internet signal through the electrical mains circuit of your home, effectively turning any plug socket in your home into an internet access point. Powerlines are perfect for providing connectivity to non-wireless devices where a cabled connection is required. What is a powerline kit and when do I need one? If you need a cabled internet connection in rooms far away from your router, powerline kits are the perfect solution. With the ability to buy powerline kits or individual adapters, you can easily expand your home network as and when you want to. Your internet signal is sent through the main electrical ring-circuit of your home by the sender unit (connected to the router), which transmits to the receivers (plugged into any mains socket) for stable, wired internet access. Powerlines are made up of two important connectors – a sender unit and a receiver. The sender unit is plugged into a mains plug with an Ethernet connection to the router, while the receiver is plugged into any free socket near the device you want to connect. All you then need to do is connect an Ethernet cable between the receiver and the device for a stable, wired connection. Varying in speed just like routers, powerline kits are rated in the same way – from 500 to 1200 megabits per second (Mbps). A 500 Mbps rating is suitable for basic internet use, while 1200 Mbps provides the speeds required for smart TV and console performance. For optimum speeds and stability, it’s best to match your powerline kit to your router rating. To make sure you aren’t using up precious plug sockets, some powerline kits support pass-through, which allows you to continue to use the plug socket despite it containing a powerline plug. Please note: If you have multiple electrical ring circuits in your home, a powerline kit will not work as the signal is unable to pass through them. Offering a solution for homes that lack complete internet coverage, range extenders (sometimes called signal boosters) relay your WiFi signal to give you a better overall connection. By placing a range extender in an area with poor reception but within the reach of your network, you ensure that every corner of your home has a good signal. If you have outdoor areas that aren’t reached by your current wireless signal, a range extender is perfect for stretching your internet coverage – perfect for summer afternoons in the garden. Why do I need a range extender? If you suffer inconsistent network speed and stability, range extenders let you increase the reach of your WiFi to make sure it covers your entire home and even into your garden. Like routers, there are different ratings for varying speeds and signal ranges, to make it easy to find the right one for your network. Because range extenders don’t need a network configuration, they’re ideal for use with Sky routers, offering an instant solution for weak WiFi signals. The range extender needs to be within reach of your network signal, but directed towards the area of poor reception in order to relay the signal further. Perfect for homes with thick walls or areas that are far away from your network device, the range extender broadcasts your WiFi to make sure you can reach it even if you’re in the garden. Rated just like routers, you can easily choose an extender by matching it to your router. To find the rating of your router (from N300 to AC), check the bottom or side of your device. If your current router is rated N300 or less, it’s worth considering an upgraded router instead, as an upgrade will offer faster speeds, an improved range and a more stable connection. Perfect for older laptops that aren’t compatible with AC WiFi speeds, wireless adapters plug easily into a USB port so that you can connect to high speed internet wherever you are. A wireless adapter provides a connection to wireless networks at home or in public places by fitting easily into any USB port. Why should I buy a wireless adapter? Access faster WiFi connections on older laptops or those without integrated network adapters without having to upgrade your computer with a wireless adapter. Which speed should I opt for? Rated using the same system as routers (ranging from N150 to AC1200) it’s easy to find an adapter that suits your router’s speed. If you want to connect at optimum speeds, AC is the best choice. A network switch provides a wired internet connection to several devices at the same time and only requires one phone line. While network switches don’t offer the wireless capabilities or built-in security of a router, they often deliver faster speeds – perfect for a small business network. A network switch works by providing a wired internet connection using a single phone line. Connect your devices to the switch using Ethernet cables and you’re ready to go. When would I need a network switch? A network switch connects multiple devices to a single network via Ethernet cables, whereas a router creates a local network which is connected to the internet. Perfect for connecting a number of non-wireless devices like PCs, TVs and older printers, network switches are typically faster and are the ideal basis for an expansive connected network. Why shouldn’t I purchase a router instead? If you have a large number of devices that require Ethernet connectivity, and you need to get online quickly, a network switch might be a great solution. Offering faster speeds than standard routers and allowing you connectivity for a number of devices, network switches are ideal for small to medium-sized businesses. Network switches can support incredibly fast Gigabit Ethernet, offering speeds of up to a theoretical 1000 Mpbs. However the speed you can achieve with a network switch won’t exceed the maximum speed provided by your network.